To play a wrote note is insignificant, to play without passion is inexcusable. Currently pursuing her Masters in Music Education, Ms. Ledbetter has vast experience as a band director and performer in both county and university symphonies, summer festivals, and professional affiliatiates. 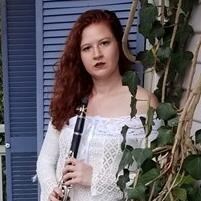 Her versatility as a player enables her to work with numerous students and comprehend the difficulties associated with that instrument to make her students better players. Request Lessons with Shelby Ledbetter today!